Disclaimer: the information on this page should not prevent you from seeking medical advice. Back pain is frequently due to the way in which we sit or stand. 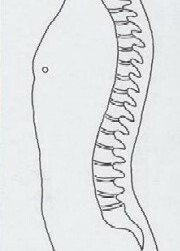 When properly used, the human spine carries weight from the head - the heaviest part of the human anatomy - to the feet without undue strain, but if the head, neck and back are out of alignment, too much stress is placed on the intermediate vertebrae and the related nerves may become inflamed, causing pain. 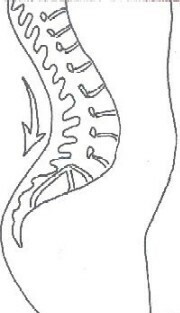 Seen from the side, a healthy spine has two curves in it, like the letter "S", but if these curves become too accentuated, the spine is no longer able to carry out its function efficiently. A research project jointly funded by the National Health Service and the Medical Research Council, involving 550 patients, is currently being carried out by the University of Southampton and the University of Bristol, U.K., to establish the benefits and cost-effectiveness of the Alexander Technique as compared with massage therapy and other treatment normally offered by the NHS for chronic or recurrent back pain. The project began in 2001 and is scheduled to end in 2005. This condition is commonly referred to as "round shoulders" and often results from working long hours at a desk or computer. 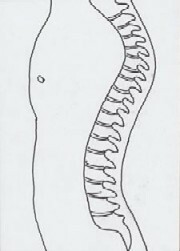 The curve of the upper vertebrae becomes excessive and the head is carried too far forward with respect to the shoulders. As the condition progresses, the weight of the head itself causes the curvature to become more pronounced. Pain in the upper back is likely to follow. In this condition, it is the lower curve of the back which becomes accentuated. The buttocks protrude, the pelvis is tilted at an unnatural angle and in some cases the shoulders are pulled too far back, in a "military" fashion. Excruciating lumbar pain can be the outcome. Scoliosis is the name given to lateral curvature of the spine, which can develop during adolescence, sometimes as the result of a trauma such as a broken leg but more often simply from asymmetric posture, particularly when sitting at a school desk. 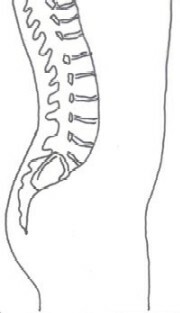 Nature tends to create a compensatory curve above or below the original defect; so the spine ends up looking like an "S" when seen from behind, instead of running in a straight line from head to "tail". 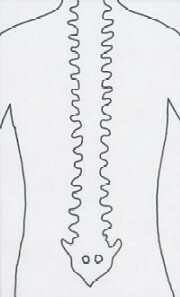 In 1980, a study entitled Postural Management of Scoliosis in the Adolescent and Adult Based on the Alexander Technique, conducted by Deborah Caplan, a certified AT teacher, demonstrated that scoliosis patients can significantly improve their appearance and strengthen their spine by practising the technique. A hernia occurs when one of the cartilaginous disks that separate the vetrebrae slips out of position. Since important nerves join the spinal cord in conjunction with each vertebra, these can become painfully inflamed owing to pressure resulting from the misplaced disk. An operation may be unavoidable if the condition is far advanced, but even in this case the Alexander Technique is useful, as it can prevent further hernia trouble; where the disorder is at an early stage, it can forestall the need for surgical intervention altogether. This frequently occurs in conjunction with kyphosis (see above). It often afflicts office workers, because they spend a long time each day peering at a computer monitor that may be incorrectly positioned. Sufferers can be re-educated to restore the natural alignment of head and neck, often with seemingly miraculous results. Jones and Gilley (1960) used radiographs to confirm that the Alexander movements produced an increase in the length of the sternomastoid muscles, these being key muscles in the control of head position and movement. Further examination of the radiographs showed that there was an increase in the height of the cervical discs in Alexander subjects. It has been demonstrated that chronic pain can be relieved by practising the Alexander Technique. In an internal research project completed in 1994 by the Pain Management Clinic at Kingston Hospital (Kingston-on-Thames, Surrey, U.K.), 50 patients attending the clinic were monitored for two years. The results showed that those who learned the Alexander Technique experienced less pain, felt less depressed and were able to achieve more. In consquence, Kingston Hospital now offers training in the technique under the National Health Service as part of its Pain Management programme. In a study conducted by Keren Fisher of the Royal National Orthopaedic Hospital (Brockley Hill, Stanmore, Middlesex, U.K.) and published in 1988, chronic pain sufferers were followed up after three months and one year. In this case, too, the Alexander Technique was found to be highly effective. At the start of his career, F. M. Alexander was known as "the breathing doctor", because his technique resulted in improved breathing. It has since been observed that people who practise the technique breathe more slowly and deeply. Respiratory disorders can be exacerbated by unnatural - and unnecessary - tension in the thorax. John Austin, M.D., and Pearl Ausubel, B.A., described this condition in a paper published in Chest (Vol. 102, August 1992) as follows: "Habitual thoracic muscular tensions may act as a muscular corset to restrict movements of the chest cage." They carried out a study involving 20 subjects, 10 of whom had lessons in the Alexander Technique while 10 were followed as a control group. "Blind" spirometric tests showed significant improvements, after instruction in the Alexander Technique, with regard to four parameters: peak expiratory flow (PEF), maximal voluntary ventilation (MVV), maximal inspiratory mouth pressure (MIP) and maximal expiratory mouth pressure (MEP). The authors' conclusion was that "AT promotes active use of the abdominal and lumbar paraspinous muscles", improving respiratory function. A series of studies carried out during the 1960s and 1970s at Tufts University, U.S.A., using electromyography and EMG equipment, demonstrated that the Alexander Technique could produce a marked reduction in stress levels. The results are included in the book Freedom to Change- The Development and Science of the Alexander Technique by Frank Pierce Jones, who was responsible for the studies. 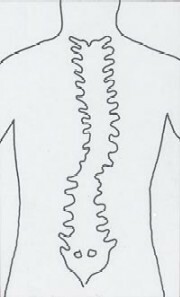 An explanation for this phenomenon is given by David Garlick, Bsc(Med), in his book The Lost Sixth Sense: "Access, as provided by the Technique, to one's muscle state provides one with the opportunity of a choice; for instance, 'I do not wish to continue being tense; I will discontinue or inhibit muscle contractions or tensions'. So one can break the habit of a non-productive mood." "The mind comes back in touch with the body and it gives a rewarding sense of re-integration, of being back in touch with oneself."